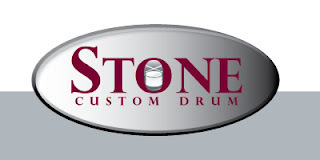 Stone Custom Drum is the Manufacture of one-off custom drums and drumshells using the "Original Slingerland" drumshell manufacturing equipment. 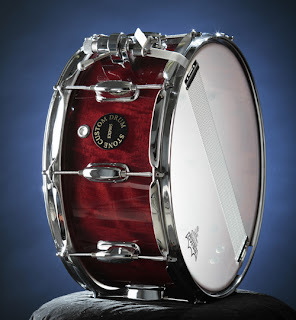 This snare drum was hand built by Bernie Stone as a custom prototype featuring 6 ply construction quilted mahogany exterior and interior plus with North American (Indiana) cherry and maple (Michigan) cross laminate interior plys. The snare drum is 14" diameter 7" deep. Bearing edges are 45 degree inside cut and a 45 degree outside radius back cut. Snare beds are medium depth 6" wide 3 angle cut. The finish is a custom mix red mahogany an was chosen to accent the beautiful figuring in the quilted mohaghany wood. The deep luster finish comes from 7 coats of sprayed urethane clear machine polished with a fine wool pad. This drum was assembled using common "off the shelf" hardware available from various suppliers. The snare throw off is from Trick Drums and is a very smooth and reliable mechanism .This drum was delivered with Remo "Ambassador" heads top and bottom. Die cast hoops, custom machined lug casings and alloy snares . Basically the hardware combinations are endless! Whatever the customer wants they can build not to mention they are also a drum shell manufacturing facility; building custom and exotic shells for other boutique/custom drum builders world wide using the "Original Slingerland" drumshell manufacturing equipment. This is an amazing snare with remarkable sensitivity and clarity. It has warm tonality with a crisp snap and projects well. It will complement any set and style of music. My first impression was when I opened the box is that still smelled like a woodworking shop. I immediately noticed the craftsmanship that went into making it. It did not have a flaw and you could just tell that it was made buy a true professional; that cared about the end product as much if not more then the bottom line. You just do not see this type of quality everyday. Order yours today, you will be very happy since they are custom built to fit your needs. © 2011 localmusicgear.com All rights reserved.. Awesome Inc. theme. Powered by Blogger.